Demands for higher developer productivity and faster time to market. The need to manage a massive increase in new and rapidly changing data types. The wholesale shift to distributed systems and cloud computing. 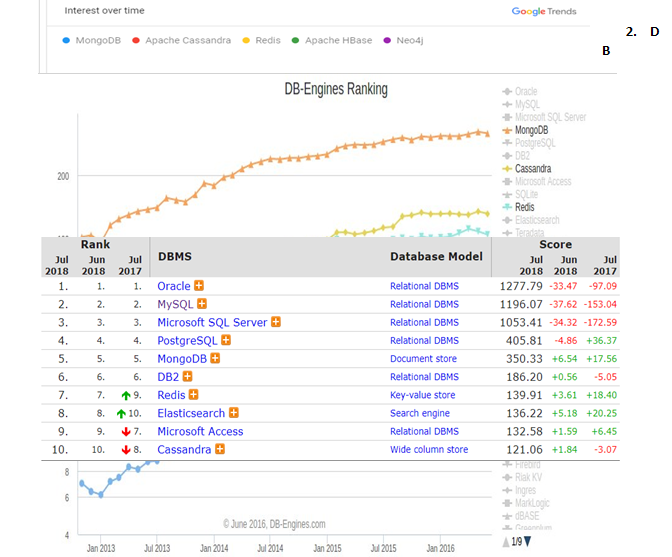 This gave rise to non-tabular databases like MongoDB. MongoDB is a free and open-source cross-platform document-oriented database program. Classified as a NoSQL database program, MongoDB uses JSON-like documents with schemas. A NoSQL database provides a mechanism for storage and retrieval of data that is modeled in means other than the tabular relations used in relational databases. In MongoDB data is represented as a collection of JSON documents while in MySQL, data is in tables and rows. When it comes to querying, we have to put a string in the query language that the DB system parses. The query language is called Structured Query Language. On the other hand, MongoDB’s querying is object-oriented, which means you pass MongoDB a document explaining what you are querying and there is no parsing. One big benefit of SQL is the Join statement which allows querying across several tables. MongoDB, on the other hand, does not support JOINS but instead supports multi-dimensional data types like documents and arrays. In SQL we can have one document inside another. In MongoDB, we have one array of comments and one collection of posts within a post. SQL supports atomic transactions. You can have several operations within a transaction and you can roll back as if you have a single operation. There is no support for transactions in MongoDB and the single operation is atomic. In MongoDB, we need not define the schema. We can just drop in the documents. In the case of SQL, we need to define the tables and columns before storage. There are no reporting tools with MongoDB i.e. performance testing and analysis is not always possible. In SQL we get several reporting tools. Definition SQL or structured query language is a domain specific language used in programming and designed for managing data held in a Relational Database Management System (RDBMS). It is particularly useful in handling structured data where there are relations between different entities/variables of the data. MongoDB is a free and open-source cross-platform document-oriented database program. Classified as a NoSQL database program, MongoDB uses JSON-like documents with schemas. About Designed by Donald.D.Chamberlin and Raymond Boyce and first appeared in 1974. Developed by MongoDB Inc. and first released in the year 2009, MongoDB is primarily written in C++, C and Java Script. Primary Key-Specify any unique column or column combination as a primary key. Primary key-In MongoDB the primary key is automatically set to the id field. It also supports JSON data model, Auto-Sharding and built-in replication. Data Structure fits for tables and rows. Strong dependence on multi-row transactions. When there are no database administrators. When in a dilemma as to whether to opt for MongoDB or SQL, companies need to keep in mind their data volume and needs. SQL is more apt for smaller datasets whereas MongoDB is capable of handling large unstructured datasets. SQL is recognized for its high performance, flexibility, reliable data protection, high availability, and management ease. MongoDB is, on the other hand, is a go-to solution because of its open and simple philosophy and collaborative and helpful community. In the event that your data is unstructured, complex, there is no pre-determined schema and you need to handle large amounts of data and store it as documents, MongoDB can be preferred over SQL.